This option is ideal for partners authorized by any of the EU regulators that wish to become an Affiliate member of Mastercard®. This allows the partner to indicate on the back of the card that they are the issuer and they have a closer relationship with Mastercard than Programme Managers. 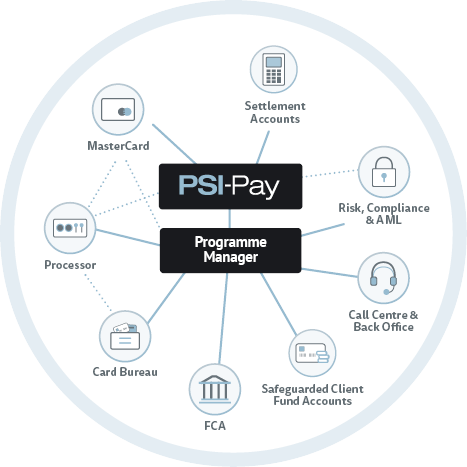 PSI-Pay Ltd is authorised and regulated by the Financial Conduct Authority (FCA) under the Electronic Money Regulations 2011 (FCA register number 900011) for the issuing of electronic money. PSI-Pay Ltd registered office is at Afon Building, Worthing Road, Horsham, West Sussex, RH12 1TL, England. Copyright © 2015 PSI-Pay. All Rights Reserved.